Haidy Finger was inspired by her grandmother Mahitibel Gorre. She spent many hours with Mahitibel in the kitchen baking and cooking for many events. As an adult, she decided to work in several restaurants as a server and soon realized that she wanted to cook and create food. Haidy entered the Culinary Arts program at Camden County Technical Institute. After completion, she worked at Virtuous Women Bakery training to blend the awesome, different flavors of the soul. After two years of baking, she decided to broaden her love for food and accepted a position at Fresh Fields as a Cook. After the company discovered her true talents, she was soon promoted to the position of Catering Sous Chef in Philadelphia area. She increased sales by aggressively seeking out new clients in the Philadelphia area. Haidy, as the new Sous Chef, participated in the opening of several new Wholefoods Markets in Atlanta, Washington, Georgetown, and hometown Philadelphia. Haidy came to Abundant Harvest Catering under the leadership of Chef Kendall Selby allowing her to fine tune her skills as a Sous Chef. 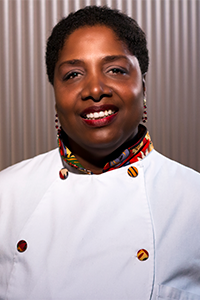 She currently works with the new Director/Executive Chef Joe Brown at Abundant Harvest Catering continuing to expand her skills as a Chef.